Wyoming is a state with a small population spread over a large geographic area. In spite of that, Wyoming is no exception to the general U.S. trend of growing jobs in health care. The population of the state is aging and needs more health care workers, in particular radiologic technologists. Across the country, jobs in this field are expected to increase by 12 percent between now and 2026. This rate is faster than the increase in all jobs on average. Now is an excellent time for anyone to earn a certificate or degree in radiography and to seek a job working in this area of health care. On average in the U.S. those working in radiologic technology make an hourly wage of $29. The average annual salary is $60,320. In Wyoming, the average is not far from the national numbers. A radiologic technologist in the state can expect, on average, to earn $56,040 per year or $26.94 per hour. The annual salary can be up to $78,000 with years of experience or with areas of specialization. Likewise, the hourly wage can be up to $37.50. Although the averages are a little bit less than in other areas of the country, the cost of living in Wyoming is also less. Radiologic technologists can expect to earn a comfortable living here. More information on Rad Tech salaries in Wyoming. Radiologic technologists are required to hold a license to work in Wyoming. The licensing is administered through the Wyoming Board of Radiologic Technologists Examiners. To get a license, workers in this field must first complete an appropriate course of study at a university or college. After graduating, the exam set by the American Registry of Radiologic Technologists (ARRT) must be taken and passed. For specializations in nuclear medicine or radiation therapy, a separate state exam must be passed. Licenses are good for a period of two years and there are no continuing education requirements. Wyoming also offers a limited, one-year license and a special license for students in emergency situations. There are a few schools in Wyoming that offer programs in radiography or radiologic technology. Casper College, Casper. This community college in the state’s second largest city offers a two-year degree in radiography. Students who complete the program are prepared to pass the ARRT exam, but may also choose to specialize in CT imaging, nuclear medicine, radiation therapy, or other areas. Laramie County Community College, Cheyenne. Students here can earn an Associate of Applied Science degree in radiography. The program prepares students to take and pass the ARRT exam. Spots in the program are limited due to the number of hospitals available for clinical experiences. There are a couple of other options in the state for students interested in radiography and health care careers. Western Wyoming Community College, Rock Springs. Western offers a pre-radiology course of study which allows students in this remote area to begin an education in radiologic technology. Students take prerequisite courses here and then complete the associate of applied science degree at Weber State University in Ogden, Utah. Northwest College, Powell. Northwest does not currently have a program in radiologic technology, but it does offer certificate programs in nursing. Students in the area of Powell who are interested in health care and radiology might consider earning a certificate here to get started in this field. Out-of-state options are Salt Lake City, Boulder, Denver Aurora, Lakewood and Colorado Springs. Wyoming is sparsely populated, but there are hospitals and medical centers concentrated in the larger cities that need radiologic technologists. Those that are smaller and in rural areas also need workers. 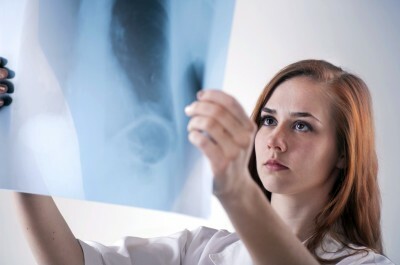 National organizations for workers in radiologic technology include the American Registry of Radiologic Technologists, which sets the licensing exam, and the American Society of Radiologic Technologists. The state affiliate of the latter is another organization that workers in Wyoming may consider joining. It is called the Wyoming Society of Radiologic Technologists. Another important organization is the Joint Review Committee on Education in Radiologic Technology. This group is responsible for accrediting educational programs and is a good source of further information.